I’d been searching for a wholesome, super healthy bread recipe for a long, long time, as bread was one of the only foods I ate that I didn’t make from scratch and I like to know what’s really in my food. Store-bought, overly processed bread just does not seem to agree with me and although I do indulge occasionally, it is best avoided. I was overjoyed when this recipe for Life-Changing Loaf of Bread popped into my mail box from the beloved My New Roots blog, as it saved me many, many hours in the kitchen and gave me some serious inspiration to bake. I’ve called my take on this recipe ‘Embas Bread’, as in stark contrast to regular wheat bread, this keeps you going for hours, much in the same way that Lembas Bread kept those wee Hobbits trekking for days. And my other name (no, not Super Foodie, the other one) is Em. Ta da! 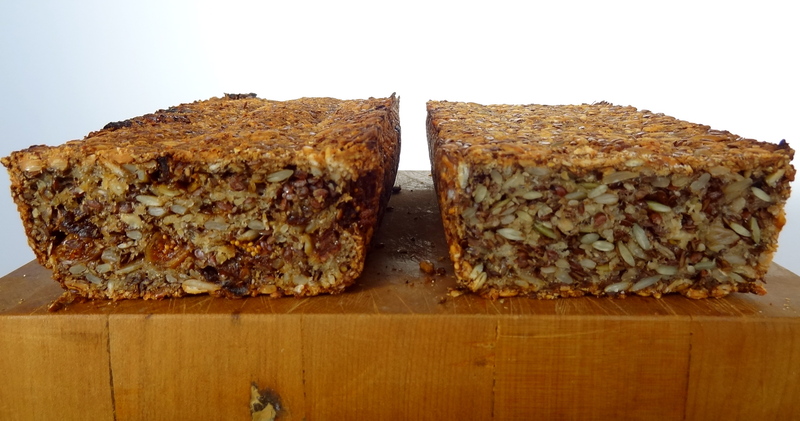 I’ve adapted the original recipe by increasing the ratio of flaxseeds and decreasing the sunflower seeds, oil and salt. I’ve also made two versions of this bread, a savoury and a sweet. The sweet option is my fave and is reminiscent of the Müsli-Brot that was a weekly staple whilst living in Berlin. It’s laden with figs and dates, spiced with cinnamon and mixed spice and is perfect for breakfast as banana on toast. The savoury version is also rather delicious and certainly keeps the Other Half happy. I make them both at the same time and store them in the freezer, sliced and ready to tuck in to. Both versions of the bread are extremely nutritious and get a big Super Foodie tick of approval. Psyllium husks are high in both soluble and insoluble fibre and keep those bowels in top form. Flaxseed and chia are tiny seeds with mighty powers which provide a solid protein hit, as well as alpha-linolenic acid (ALA), the plant-based omega-3 fat which is very good for your heart. 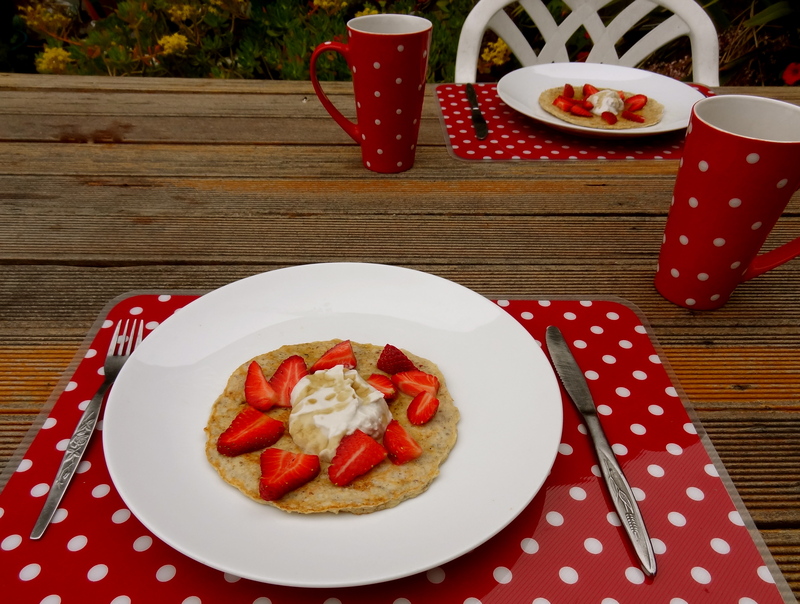 There is also no flour in these recipes, the base being made up of rolled oats, which are renowned for sustained energy release to keep you powering through the day. As well as being a Super Foodie dream, this recipe is also easy. No kneading, no rising, no finicky measures. Just bang it all in a bowl or pan, wait a couple of hours or overnight, bake and await the glorious scent of fresh bread wafting through your home. Grease a loaf pan or line with baking paper. Mix all of the dry ingredients in a bowl or in the loaf pan. Mix all of the wet ingredients together, add to the dry ingredients and mix well. If using a bowl, transfer mixture into the loaf pan. Spread evenly in the pan and allow to rest for anywhere between 2 – 24 hours. Preheat the oven to 160° c fan bake. Place loaf in the oven and cook for 25 minutes. Remove the loaf from the pan and place upside down on the oven rack and cook for a further 25-30 minutes. The loaf is ready when it’s a wonderful golden brown colour and sounds hollow when tapped. I’m so into bananarama shakes right now. I simply must have at least one per day, usually straight after work or on weekend afternoons before heading to the Botanics for some frisbee extravaganza action. I usually make my bananaramas with almond milk, but my dear friend and fellow food blogger Kauia Moriaty who writes the wunderbar eat it blog, informed me of the ladies who are spreading the joys of fermenting to the masses. Elenore Bendel Zahn who writes the Earthsprout blog and Sarah Britton from My New Roots are pioneering this fermentastic revolution and provide thorough and informed expositions on the benefits of fermenting fabulously. I’m fairly new to fermenting, in fact, I’d only ever fermented kefir using cow’s milk and the result was seriously tart – so tart, it was undrinkable. The Fabulous Fermentation Week inspired me to try again and reap the nutritional rewards of these (dare I say) seriously strange grains. Kefir is fermented milk made with kefir grains, which is a symbiotic culture of yeasts and good bacteria. It’s believed to have originated in the Caucasus mountains and is increasing in popularity as people are waking up to its incredible health benefits. Kefir is highly nutritious, full of gut-aiding probiotics and has a good dose of B12, which is good news for vegans and vegetarians whose diets are usually lacking in this integral vitamin. It also contains vitamins B1, B6, D, as well as folic acid, iodine, calcium and iron. Kefir can also be made from various types of milk, including coconut, almond, rice, seed, soy or dairy and can also ferment fruit juice and coconut water. I purchased whole milk kefir from the organic store and sat it on the bench for a couple of days until the cauliflower-esque grains appeared and the kefir had started to form. As I wanted to make an almond milk kefir, I strained the kefir and washed the wee grains thoroughly and started the kefir process again, by putting the kefir grains and a good dose of almond milk in a jar, popping the lid on and allowing it to sit for a day or two. 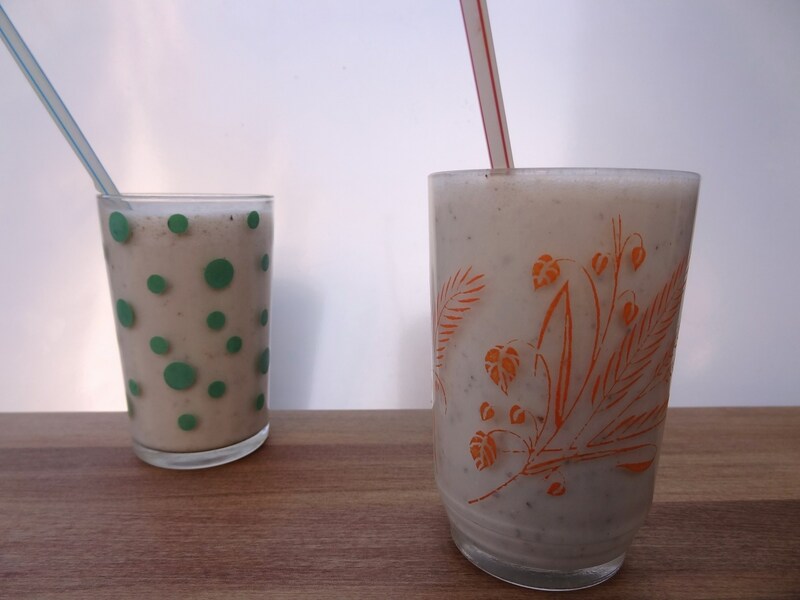 If you find it really hard to stomach uber-tart food or beverages, disguising kefir is the key. Bananas are a great way to disguise the tartiest of tart flavours and coconut milk provides a creamy hit to balance the shake. LSA (Linseed, Sunflower, Almond mix) fortified with buckwheat, quinoa and chia provide an extra nutrient hit and the honey (or agave, maple syrup) gives the bananarama shake a nectarous finish. Put all of the ingredients into a blender and whizzz. Serve on the deck in the sun with your dearest or if you’re in the cooler climes, watching the snow and dreaming of summery pastures new. To me, there is nothing more quintessentially French than clafoutis. The wunderkind of French desserts, clafoutis (kla-foo-tee) lies somewhere between a frangapine tart and a baked custard. Clafoutis hails from the Limousin region of France and is traditionally baked with the pits of the cherries still in tact, in order to ‘saveur le flavour’. To protect your precious pearly whites, my recipe requires the pits to be laboriously removed. This initial slaving over the stove is short-lived, as the simplicity of this dessert is its saving grace. A spread, a splash, a whisk, a sprinkle and viola! Pop it in the oven and await the sweet cherry almond scent to permeate the house. Cherries are aplenty right now. The cream of the crop are grown in Central Otago, just a few hours away from where we live in Dunedin (New Zealand). These cherries are renowned for being the sweetest, juiciest, shiniest you’ve ever had the pleasure of laying your mitts on. Cherries are however not just a pretty face – they are one of Mother Earth’s most powerful anti-inflammatory sources due to the presence of anthocyanins, which research has unveiled prevents free radical damage and improves memory. Cherries also contain melatonin, a hormone which assists in regulating sleep cycles. 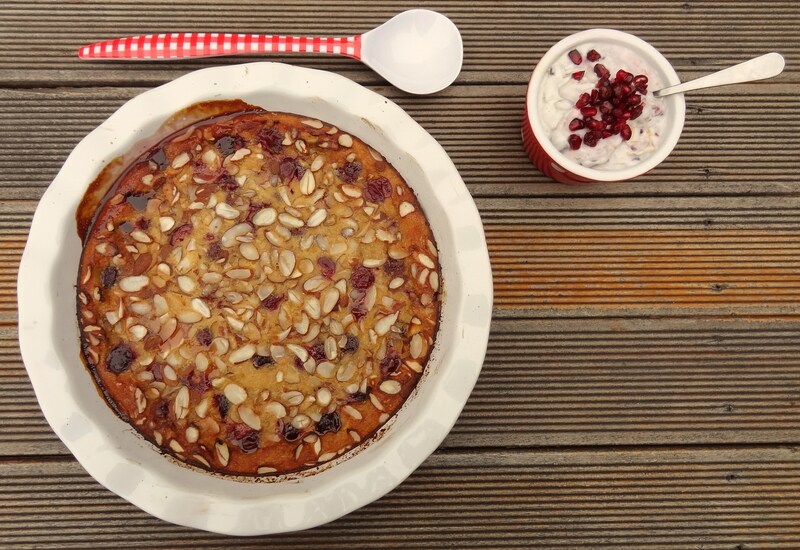 I’ve made this dessert with almond milk which works superbly, but clafoutis also works well with other milks especially cow’s milk. I’ve adapted the recipe from the Australian Taste website and given their clafoutis recipe a Super Foodie makeover, ensuring the recipe is dairy-free (if you prefer), gluten-free and using a minimally refined sugar. I’ve used coconut palm sugar, but you can use any sugar you like, as long as it’s not the over-processed, bleached and filtered white variety. Coconut palm sugar is made from coconut tree nectar and has a naturally low glycemic index compared to other sugars. It also has a higher nutrient content and is a source of potassium, zinc, iron and magnesium. When choosing coconut palm sugar, ensure it is the purest you can find in the organic section, as some brands can be mixed with cane sugar. This photo was taken by my delightfully Hilarious Sidekick Rachael Lawrence Lodge, who provided the creative direction for the shoot. Before we demolished the clafoutis, naturally. Dankeschön, Liebling! Heat the oven to 180 degrees. In a frying pan, toast the almonds until golden brown and allow to cool. Grease a large dish with coconut oil. Pit the cherries and place evenly in the greased dish. In a bowl, mix the ground almonds and sugar together and form a well. In a jug, whisk the eggs and add the almond milk, vanilla and the zest of one of the lemons. Gently pour the liquid into the sugar and almond well and combine. Pour into the dish and sprinkle with toasted almond flakes. Cook for 30 minutes or until the middle is springy. Allow to cool until slightly warm. Separate the creamiest part of the coconut cream by gently spooning it out of the refrigerated can (use the surplus liquid for smoothies or Banana, Date and Coconut Baked Porridge). Add the vanilla, zest of the second lemon and honey and whisk to form peaks. Transfer into a serving bowl and refrigerate. Garnish with whatever you please and serve with the warm clafoutis. Bon Appetit! Sunday brunch. It’s somewhat of an institution here in New Zealand. The weekend is celebrated with a long, lazy breakfasty lunch, often amidst the chaos of a café, or if you’re like me, in the quiet comfort of your sweet home, surrounded by National Radio and lashings of Lady Grey tea. I’m a sweet brunch girl – pancakes, fruit salad and Bircher muesli being on my list of hit picks. My Beau, like so many others out there, prefers a Brunch with The Works: Eggs, bacon, sausages, hash browns, roasted tomatoes, mushrooms, baked beans and toast (with marmite and cheese). That just ain’t how I roll. This recipe for brunch is perfect as it’s not too sweet and includes a hearty dose of super foods, which makes for two very happy campers. The pancakes include Quark (or Kwark), which is possibly an ingredient that if you haven’t lived in Europe, you’ll probably be thinking “what on earth?” right about now. Quark is a soft cheese, similar to cottage cheese, although it’s not made with rennet like cottage cheese and has a smoother consistency. There are different grades of quark – minimal fat, regular (20% fat) and creamy (40% fat). In this recipe, the Super Foodie panel of experts advises that the minimal fat option is the winner. Quark is high in both protein and calcium, ensuring a satisfyingly healthy brunch that’s good for your bones, whilst pleasing many a palate. Recently I’ve come across some exceptional Healtheries (brand) products, which are a welcome change from the traditional LSA (linseed, sunflower, almond) mixtures. The LSA used in this recipe has the added benefits of black chia, buckwheat and quinoa flakes, which provide extra fibre, antioxidants and essential omega-3 fatty acids. It also works super well sprinkled on yoghurt for an afternoon snack and appears to make everything just taste better. I should know – I’ve almost gone through a whole pack in 10 days. The coconut whipped cream is a take on the delectable version that I’ve seen on Brandi’s blog The Healthy Flavor. I get very inspired by the dedicated food bloggers that are beavering away in various parts of the world, creating interesting and innovative dishes. Unfortunately, many of you won’t be able to enjoy the summer strawberry season here in New Zealand, however, a berry coulis (made from frozen berries) would also make a yummo substitute. Roll on the weekend! In a bowl, mix the LSA, oat bran and baking powder together. Beat the eggs together with the quark and milk and combine with the dry ingredients. Allow to rest for a few minutes. Heat the coconut oil in a frying pan and spoon the mixture into the frying pan to create pancakes of the desired size. Whip the refrigerated coconut cream and vanilla in a beater or food processor until it forms peaks. Slice the strawberries. Layer or roll the pancakes with the strawberries and top with the coconut whipped cream. Douse in agave or maple syrup and devour. Serves 3 really hungry people or 4 relatively hungry people. Yes, I know what you’re thinking – that’s no’ how ye make porriiidge! Well, you may be right there, but this is not your average porridge. I’ve been making banana and date porridge in the traditional fashion for years now and loving the satisfyingly sweet warmth first thing in the morning. Porridge season always begins every year on the morning of Anzac Day (which falls on April the 25th) after the 6am Dawn Parade Service, which commemorates the soldiers who fought and died in the world wars. Providing we weren’t spending the New Zealand winter in the Northern Hemisphere, we would generally eat porridge until well into the spring. Then I discovered baked oatmeal, or baked porridge as it’s called in these parts. 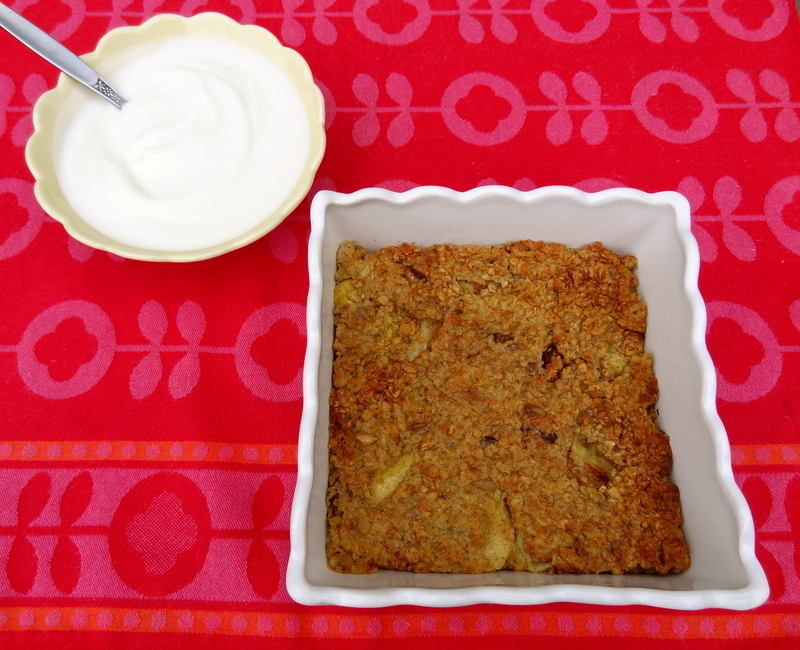 Being an avid online foodie follower, I came across a few recipes for baked oatmeal and it’s only recently that I’ve actually started making it. This recipe is a fusion of a few of the recipes I’d seen online, but has been given the usual Super Foodie makeover to ensure that it’s the best possible start to the day (or night). As with most of my recipes, you can play around with the ingredients to ensure it suits your taste and diet, whether you’re vegan, dairy-free, gluten-free or just trying to be healthier. The coconut cream gives the porridge a luscious richness and through the process of baking, the porridge develops a crispy, biscuitesque crust. It really is an indulgent yet nutritious breakfast or brunch, perfect for kick-starting the weekend. The oats contain high levels of both soluble and insoluble dietary fibre, which has proven to be effective in lowering blood cholesterol and keeping your insides so fresh and so clean (clean). Oats also have a high concentration of balanced protein, as well as a good dose of essential fatty acids, both of which promote longevity and good health. In short, this is verdammt good stuff. The beautifully designed ceramics featured in the photo are available from Whiteroom – Dunedin’s top design destination. Preheat the oven to 180°C. Grease a baking dish with coconut oil or oil. In a bowl, mix together the oats, baking powder, spices, sunflower seeds, chia seeds and Himalayan rock salt. In a separate bowl, mix the coconut cream, your choice of sweetener, vanilla and egg or egg replacement together. Add the bananas, dates and liquid mixture to the dry mixture and mix. Pour into the baking dish and pop in the oven for 30 minutes or until golden brown and crispy on top. Allow to sit for 5-10 minutes, cut up and serve with Greek yoghurt or whatever else you fancy. Serves 4 very hungry people or 6 moderately hungry people. I LOVE Nutella. In fact, I can never quite get enough of it. I find that if I start the day with this creamy, dreamy spread, by mid-morning I’ll be scrambling around the kitchen looking for anything to spread more Nutella on, whether it be strawberries, a teaspoon (errrmm, I’ll admit, a tablespoon) or an old crust of bread. However, I do limit my Nutella consumption to Europe (where I tend to eat much more chocolate in various, delectable guises) along with other hedonistic indulgences like dancing in techno clubs until 8:30am and unemployment. One of my favourite past times whilst working in Waterloo, Belgium (yes, where the Napoleon-led French army was defeated), was to visit Le Pan Quotiden – a rustic, communal table kinda place – which made delicious hazelnut and raisin baguettes and their very own chocolate hazelnut spread, in dark, milk and white chocolate flavours. The combination of the baguette, laden with plump fruit and crunchy nuts, with the dark chocolate hazelnut spread was heavenly. So heavenly in fact, I sought out new establishments in other European cities lucky enough to be home to Le Pan Quotiden such as Antwerp, Amsterdam and London and further indulged my addiction. In order to get my Nutella fix now that I’m no longer living on the Continent, I’ve found the perfect Nutella substitute which is much more in line with my superfood philosophy and tastes far superior. 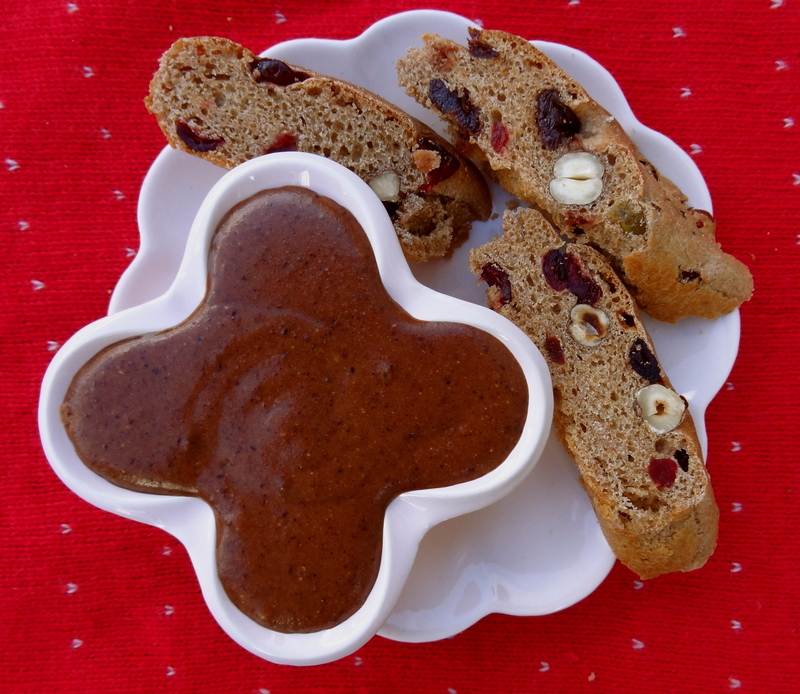 In comparison to Nutella, which is extremely high in sugar and modified palm oil, this recipe for Chocolate Hazelnut Spread is actually good for you. It has no refined sugar and is packed full of superfood goodness from the raw cacao, which you can read about in my recipe for Chocolate Avocado Mousse with Raspberries and Candied Almonds. It also contains good fats like coconut oil and hazelnuts. Hazelnuts are rich in mono-unsaturated fatty acids like oleic and the essential fatty acid linoleic acid, which increases good cholesterol and lessens bad cholesterol. Hazelnuts are also especially rich in folate, which is good news if you’re expecting a wee nipper and are also high in dietary fibre, vitamins and minerals. Happy days! When purchasing the hazelnuts, I recommend getting the freshest, best quality nuts you can find. In Dunedin, we have a stall at the Saturday market that offers the best damn hazelnuts you’ve ever had. Clive and Jen Blunden of Island Stream Hazels grow their own hazelnuts and produce an array of premium hazelnut products. Seriously, once you’ve attempted to shell generic, old hazelnuts from the supermarket, usually of Turkish origin, you’ll never make the mistake again. Ever. Or you can save yourself time and energy and buy pre-skinned hazelnuts, which make this recipe an absolute breeze. 1/4 – 1/2 a cup of nut milk (almond, hazelnut, etc or other milk if you’re not vegan) depending on how creamy you’d like it. In a baking tray, roast the activated hazelnuts at 18oºc for about 10 minutes until toasted. The skins should turn a couple of shades darker and a sweet, nutty aroma should have filled the air. While the hazelnuts are still warm, remove the skins by shaking in a fine mesh sieve, or rubbing between a tea towel or your fingers. If there are some stubborn ones, you can pop them back in the oven for a few more minutes and try again. Aim to remove at least 80% of the skins. Allow the hazelnuts to cool completely. In a food processor, blend the hazelnuts until a fine or buttery consistency is reached. If you are using cacao nibs, when the hazelnuts reach approximately the same size, pop them in to the food processor. Add the remaining ingredients and blend until smooth and velvety. This is highly addictive. You have been warned. * Activating nuts is when you soak nuts in water, thus helping to release enzyme inhibitors and phytic acid found in the outer layer of nuts (and also in seeds and grains). Phytic acid binds to the minerals in nuts, which makes it hard for the body to absorb properly. By soaking or activating nuts, our bodies get maximum benefits from the nutrients.